Body Browser is a detailed 3D model of the human body. Google's approach is a new educational tool called Google Body Browser. Launched on the Google Labs website, Google Body Browser uses HTML5 technology to let you examine the human body in fully layered, three-dimensional detail. 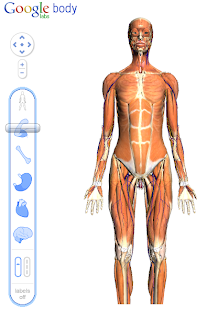 You can peel back anatomical layers, zoom in, and navigate to parts that interest you and click to identify anatomy, or search for muscles, organs, bones and more.You can also share the exact scene you are viewing by copying and pasting the corresponding URL. Google Body Browser probably won't load in your browser. The app uses WebGL, a plug-in-free programming interface, to power its 3D graphics. WebGL is a relatively new standard, and most major browsers are still testing its implementation.You will need a web browser that supports WebGL, such as the new (free and publicly available) Google Chrome Beta. When you open Google Body Browser in a WebGL-enabled program, you're greeted with an image of a woman standing face-forward wearing minimal workout attire. Controls on the left side of the screen let you zoom in and out and rotate the woman's body. You can also just click and drag with your mouse to spin her around 3D-style.The most interesting part is when you start using the Google Body Browser layering tool. 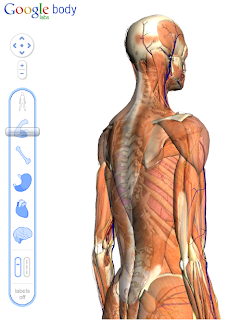 Located below the zoom controls, the layering tool lets you peel back layers of the body to see detailed views of the human anatomy. Currently, it displays a female model but Male model also is coming soon ! Watch the video below to know more about Body Browser.